Kiss have confirmed that their Kiss Kruise will return later this year. Kiss Kruise IX will leave from Miami on October 30 and return on November 4, after visiting Great Stirrup Cay, Bahamas and Falmouth, Jamaica, aboard the Norwegian Pearl. A statement reads: “There is no doubt about it – Kiss has influenced the rock’n’roll scene worldwide with their fist-pumping anthems, show stopping theatrics, and captivating live shows. “In the midst of their End Of The Road world tour, the Starchild, Demon, Spaceman, and Catman are excited hit the open ocean and you’re invited. No artists have been announced so far, but those wishing to learn more should visit the official Kiss Kruise website. 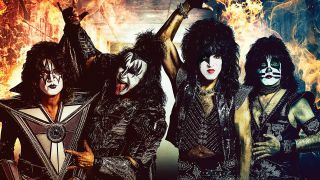 Kiss will release their Kissworld compilation album in North America for the first time this coming Friday (January 25). The 20-track collection was previously released in the UK, and will launch on CD and digital platforms to mark the start of the band’s End Of The Road tour.